Last Friday, I participated in an engaging discussion on the relationships between writing and music with 5 other authors at Black Swan Books and Music in Staunton, VA, as a benefit for the new local radio station there — WQSV 106.3. Moderated by James Madison University professor Michael Trocchia, several poets and novelists gathered to speak about how music has influenced their writing. The event was live-taped by WQSV general manager Tom DuMontier, and will be broadcast in the near future on that station. Stay tuned. I’ve been engaging in both music and writing since early childhood, and am grateful to Michael for the invitation to think more critically about just how they are woven together in my creative life. What follows is the text of my offering last Friday, including some of the poems I read aloud. May it spark you own inquiries into how words and music gift your life. Playing traditional Appalachian & Celtic tunes with my band mate, Jim Plitt, in our duo Confluence. Growing up in the household of my origin, music and poetry were twin languages, coexisting and even collaborating creatively. One was never far from the other, in a home where both parents read aloud and enjoyed music. Learning to speak and learning to sing happened simultaneously. I grew up learning to play an instrument around the same time as I was learning to write; musical notation and linguistic notation — notes and letters registering in eye, ear, and hand — were simultaneous languages of expression and exploration. One of the significant gifts of that formation was the development of an intuition — an “ear,” if you will — for harmony, proportion, breath, and pace. From Emily Dickinson to Yo-Yo Ma, traditional Appalachian fiddle tunes to Wendell Berry and the ancient Chinese poets, I’ve always felt most moved when the individual elements of the poem or the piece of music (words, phrases, line-breaks, etc.) disappear into a larger lyrical arc that carries the listener along with it. Our home & workshop, in the Blue Ridge Mountains of Virginia. 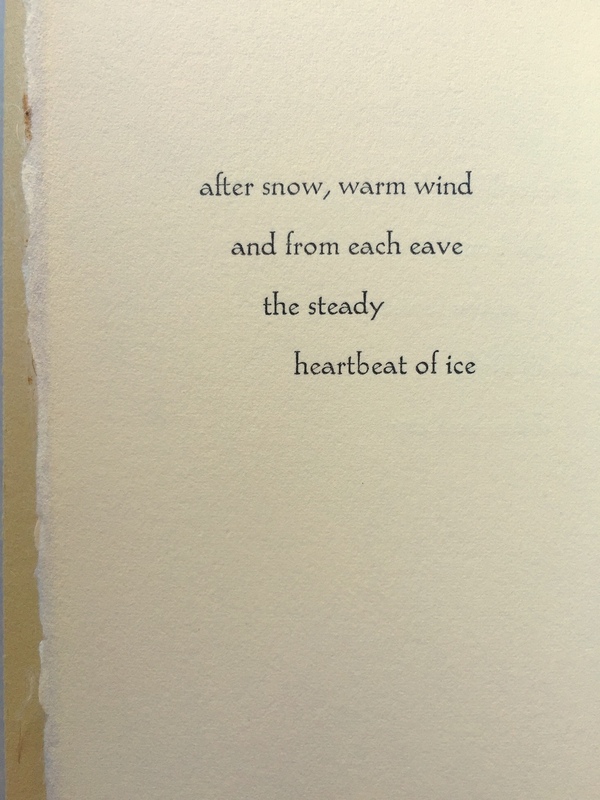 In composing my book, Soundings, a collection of several dozen haiku & short poems, these intuitions of harmony/proportion, breath, and pace took on… maybe not greater importance, but certainly more obvious importance. Traditionally, in Japan, the haiku was formed to fit within one breath — it should take just one breath to speak the complete poem. (Which, incidentally, makes me wonder, does it take just one breath to hear it?) The inspiration — a word which, of course, literally means “to breath in” — for many of my poems arises from the place where my spouse and I live, in a Blue Ridge mountain valley. Living there acquaints one with a lot of silence as well as a lot of earth-sounds — from wind to spring frogs, snowfall to warblers — and all of it is present in my work, in the proportion in which it’s present in my life. "Composing" the metal type for a broadside featuring a poem by Stan Galloway called "Winter Garden." Musicality features prominently in my day-job as well, as a letterpress printer and book maker. I spend my days gathering letters made from metal and wood into rhythmic lines, into a visual arrangement of their auditory form (a process that, for centuries in the printing trade, has been called “composing”), and then placing this text on a well-proportioned page that harmonizes the speaking words with the silent white spaces around them. So, who knows where one medium ends and the other begins? Where writing and singing, speaking and listening, diverge or come together again? It’s all so deep within us. As old as heartbeat and tide. As native as the cry we raised at the moment of birth, our first song.